If technology is supposed to make our lives simpler, why do our lives seem more stressful than ever? One reason might be the endless digital drudgery that dominates our workdays—too much time spent on menial, manual tasks better left to the robots in our midst. But with a little help from our favorite task-automation service, IFTTT, you can put mundane chores on autopilot and spend more time on the interesting stuff. IFTTT stands for If This, Then That. It’s a free service that lets you build simple, automated processes to handle various online situations. From performing automated Craigslist searches and sending you the relevant results to automatically emailing your colleagues when your plane lands in their area, IFTTT can make you instantly more productive with almost no effort on your part. IFTTT does its thing by connecting to a whole bunch of cloud-based services, ranging from Dropbox and Google Drive to iOS Reminders, Facebook, Twitter, and Instagram. You can link your cloud accounts to your IFTTT account and then watch for events that can trigger actions. 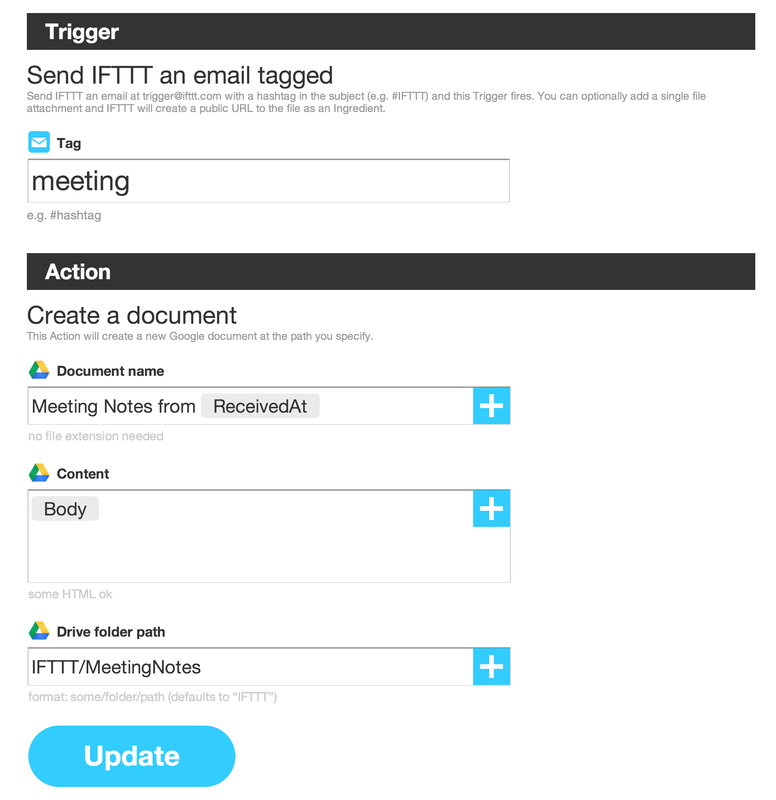 The heart of IFTTT’s automation strategy is the recipe—a fairly simple set of instructions that tells IFTTT to watch a channel (such as Gmail) for an event (like, say, a message containing a specific word in the subject line) and, when that condition is satisfied, to trigger a customized response (such as sending you a text message or formatting the contents of a qualifying email message into a document). To create or use recipes, you must first activate channels for the cloud services you’d like to use. Currently, 76 channels are available, including Craigslist, Dropbox, Gmail, Facebook, and Twitter. There are generic channels, too, for sending email and SMS messages, triggering actions at specific times, or accepting triggers via voicemail. And there are mobile channels for tracking the location of your phone or interacting with iOS apps. Creating a recipe is as easy as telling IFTTT what channel and event to watch for and what response to trigger. You can easily write your own recipes on IFTTT if you like, but you don’t have to. The easiest way to get started is to piggyback on the work that others have done, by using shared recipes from the IFTTT community. Note: At the moment, IFTTT is heavily skewed in favor of iOS users, and doesn’t directly support Android devices for certain features. That said, many third-party channels, such as Pushover, have Android apps of their own. This simple recipe takes the contents of a voicemail message and drops them directly into Google Calendar. To use it, just dial the IFTTT number and say exactly the words you want put into Google Calendar, like this: “10am tomorrow, call Jane Smith.” Voilà: Your event will appear on the calendar. Tired of searching through Gmail for an email message that has an attachment you need? With this recipe, all your incoming attachments will be automatically sent to a Dropbox folder for easy retrieval. Not a Dropbox user? You can easily create your own version of this recipe to use Box or Google Drive instead. Sometimes the hardest part of remembering to do something is taking a moment to create the reminder. This recipe lets you create a to-do in your iOS Reminders app by sending an email tagged #todo to IFTTT’s trigger address. If you wanted to, you could create an alternative version that uses Toodledo. IFTTT can get fairly sophisticated when dealing with location-based triggers. This recipe will automatically add an entry into a Google spreadsheet every time you arrive at or leave your office. It’s a virtually effortless way to track your hours. To use it, you’ll have to search for your office’s location in the location menu, and then configure the names of the folder and timesheet that the recipe will create. You can customize the formatting of the entry, too. Keeping up with social media can be an unwelcome hassle when you’re swamped with work, but it’s an important task at many businesses. This handy recipe will watch for new posts on your company’s page and automatically share them on your personal wall. You can personalize the link formatting and message to make the posts more appealing to your circle of friends. I’m always forgetting to track my mileage and having to figure it out from memory at the end of the month. This recipe helps me track mileage on the fly, by sending a text message tagged #miles with the number of miles I want to add. The entries appear on separate lines of a Google spreadsheet, so they're easy to add up at the end of the month in just a few clicks. Keeping notes about meetings is important, but they tend to get lost and ignored when you send them as email attachments. With this recipe, you can send the notes via email, and they’ll be formatted automatically as documents in a Google Drive folder you can share with the group. It won't guarantee that anyone will read your notes, but at least it won't clutter up anyone’s inbox. Even in this economy, finding the right candidates for some positions can be incredibly challenging. Fortunately, Craigslist remains a great source of talent. With this recipe, you can search for relevant résumé postings in your region, and they’ll automatically appear in your email inbox. Be sure to customize your search terms as specifically as you can, to avoid being inundated with irrelevant submissions. Craigslist can be just as useful for finding new opportunities for yourself as for finding new talent for your business. This recipe turns the previous one on its head, searching Craigslist for interesting job listings and sending them your way. Again, you can customize the Craigslist search as you see fit, and you should be avoid excessively broad search terms. There are enough great IFTTT recipes to fill a cookbook. 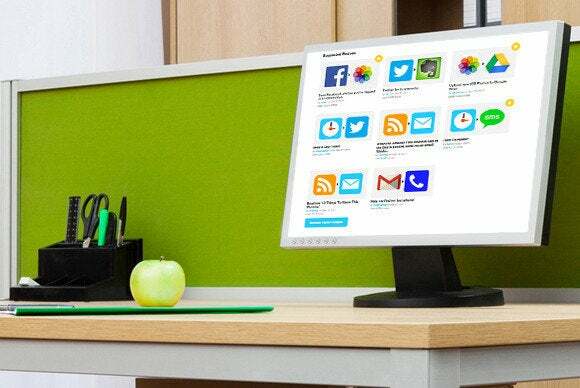 PCWorld senior writer Brad Chacos found IFTTT recipes that you can use to automate your online life. Just browse IFTTT's site to find more—or create your own.